2. It's been sitting on my bookshelf for awhile. I'm trying to work through a lot of the shorter books that I seem to continually purchase but never made the time for. At the same time, I'm feeling sort of listless in my reading of late and am irritatingly (to myself) unmotivated to dive into something deeper. I'm hoping to shake the mental reading fog here soon. At any rate, I read Plain Girl . I picked it up in the first place because it was by the same author of Miracles on Maple Hill (linked to my thoughts) which I really enjoyed. First published in 1955, it seems a precursor to the modern storm of Amish fiction which we can readily find on bookstore shelves today. This is the story of ten-year-old Esther, who is Amish. Pennsylvania's compulsory school law is forcing Esther's family to attend the local public school. Of course, Esther's father doesn't want her to go, in part because she has an older brother who once attend the same public school and eventually left home because he became curious about the world outside of his immediate community. Esther attends the school, makes a friend she doesn't know if she is allowed to have, reconnects with her brother and has her horizons broadened as well. The storyline sounds so familiar to us nowadays. There are true life stories being published about people who have left the Amish (like this one) and plenty of Christian fiction titles which obsess about Amish culture. Beverly Lewis seems to be the main instigator of this, although I believe most of her titles are adult works. In searching for Amish fiction written specifically for children, I found a children's title which was published prior to Plain Girl . In 1936, Marguerite de Angeli write a book called Henner's Lydia which is about a "tender Amish family." In 1944 this same author wrote Yonie Wondernose which was a Caldecott Honor book, and it tells the story of Henner's younger brother, Yonie. After that, the next children's book on this subject of note seems to be Plain Girl . Note: I'm not touching books about the Amish written for adults. Just those for children. Had I not read any other book about the Amish, I probably would have found Plain Girl more quaintly enjoyable. As it was, it just sounded all too familiar. I ruined it for myself accidentally but not having read this book in my younger days. I think I'd like to correct that with my own children and introduce them to the world of the Amish via Virginia Sorensen in the first place. Then we can move on from there. Yes, sometimes I kick myself for not reading more classic literature as a younger child. I wouldn't have so much to catch up on! But alas. It is what it is and I can make my children's reading lives and histories richer for my past mistakes, right? And so I move on . . .
Hmmm. . . Having never read a piece of adult Amish fiction that I can recall, I think this might be interesting to me. Lulu read Miracles on Maple Hill last year (I think). I did read one of those leaving-the-Amish memoirs once upon a time and found it interesting. Anyway, thanks for the review. And after you introduce the kids to the Amish, you can bring the family to PAfor a visit. Educational trip! I used to listen to some Amish books to kill time in the kitchen. But it really did get old. 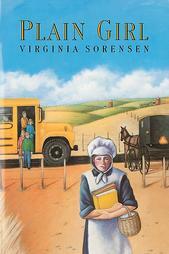 Virginia Sorensen most certainly wrote several books about the Mormons, of which I've read one. I've read Curious Missy, Miracles on Maple Hill, Plain Girl, The House Next Door, Utah 1896, and Lotte's Locket. I own Kingdom Come, but haven't read it. I like Miracles on Maple Hill and Lotte's Locket best. I will not deny that the illustrators of these books may have tipped the scales, though. (Beth and Joe Krush and Fermin Rocker respectively). If one must select Amish children's books, I prefer Henner's Lydia and Yonie Wondernose. I should point out that the edition of Plain Girl that I read was *not* illustrated by Beth and Joe Krush, although one apparently exists. Also, I preferred Lois Lenski's Shoo-Fly Girl (1963) to Plain Girl. Plain Girl felt like it had change the Amish (like many of the current popular Christian novels), while Henner's Lydia and Shoo-Fly Girl were more about letting you see how they lived without interfering too much with their lives. Oh, and after you visit Annette in PA, you can head south to AL and visit us. We live about 50 miles or so from an Amish community.